Marmot Fortress 2P Tent. For ferociously foul weather, the Fortress 2P has all the great features of Marmot's backpackers' focused Tungsten Tents like intelligent designs, durable fabrics and weather-enduring features but with a full fabric canopy and added guy outs to endure stormy weather. 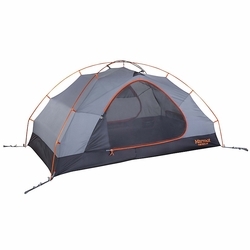 The sturdy guy lines add strength and stability to a tent, while also reducing condensation build-up. Roomy, lightweight and with all the measure to ensures bad weather protection, the Fortress is true to its name.